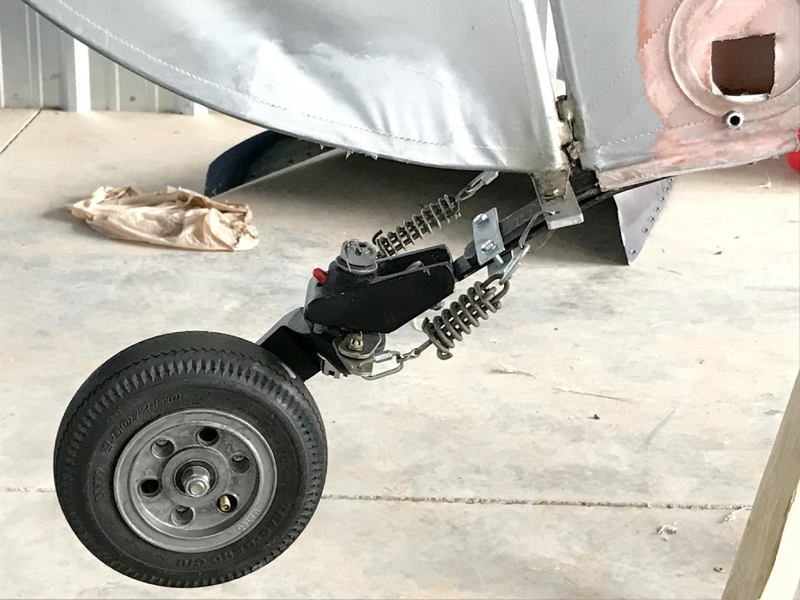 Tail Wheel Swap to a Matco Pneumatic 8"
1) I removed the Matco 45 degree wings and put on some 25 degree ones to match the Avid's rudder rigging. Had I left the 45 degree ones on, the wheel would never unlock, yielding wider turns,and crappy manual ground handling because the wheel would not swivel fully. 2) Re-bent the spring to angle the wheel down a bit. The spring had flattened enough to make the wheel pivot axis point forward, perhaps 20 degrees off the vertical, thus making the wheel lift the whole tail when it pivoted. A local car spring shop (search Automobile Suspension, leaf spring) did it while I waited for $20. Now the wheel is almost purely vertical. I bet they could have made a new one easily, too. 3) Extended the steering arms at the bottom of the rudder using a flat bar of 1" x1/8" aluminum. This extended the horn about 1.5" per side and made the steering more powerful and kept the geometry of the springs square. I bolted the flat to through old holes. 4) Rigged the springs using some threaded quick links which are much easier to use than the previous spring clips (https://www.amazon.com/gp/product/B00M9FAPYK/ref=oh_aui_detailpage_o01_s00?ie=UTF8&psc=1) I used #35 sash chain which has a working strength of 106 lbs, and which can be easily opened and built up to desired lengths. Taxi and flight tests showed great improvement in handling, the basic lock in the trail position is stiffer and steering commands are much crisper (I bet the increased steering arm was as much responsible as the wheel). Landings track straighter now, the wheel is locked more tightly in the trail position. The big spring on the right is a bear to deflect now, but tells me positively that I am getting right wheel deflection. Another positive note: the tail wheel no longer acts like a phonograph needle for all the bumps and cracks in the tarmac, taxiing is quieter. I got some tail wheel shimmy, so I tightened up everything after the flight (found the spring to fuselage bolt had lost torque, allowing the spring to rotate enough to be the cause). I would highly suggest adding some eye bolts to lessen the angle of the chains in comparison to their pull direction. The handling will further improve. You would then be able to get rid of the speed links which are known to fail often. 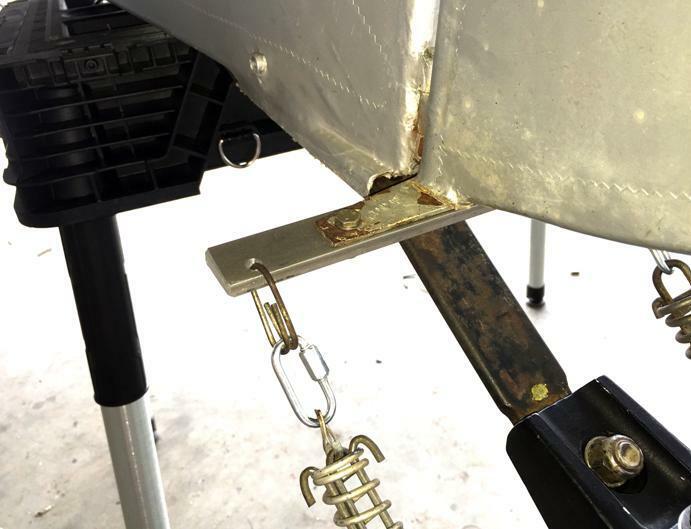 they go into the holes on the rudder bar and hang down to lessen the angle of the chains. That really helps the geometry. I just bent the rudder bar extension that I made from flat bar steel to look like an old top hat so the arms dropped down and inch and a half. That really made a difference! 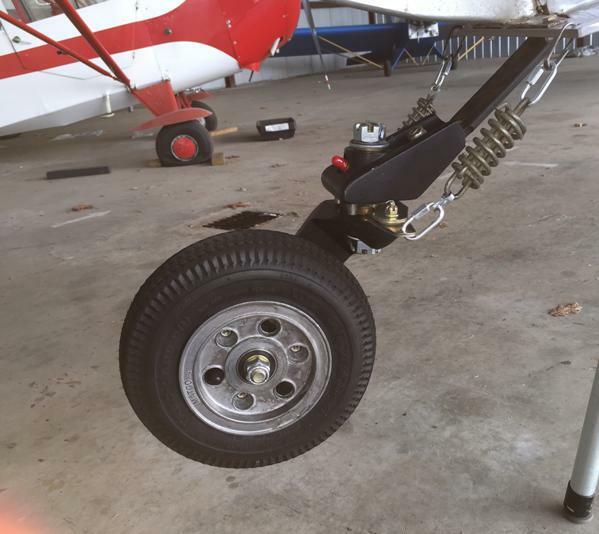 I put them on the bottom of the rudder bar and on the top of the tailwheel arms to lessen the angle of the chains. Thanks, Nick. There are, for me, some keeper ideas here. 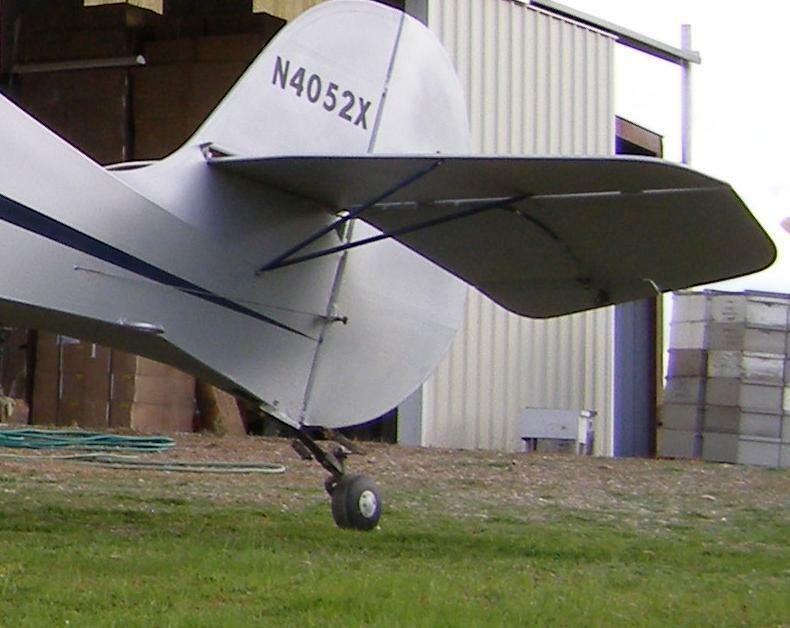 I think I will also install a bar to extend the rudder horns to the same width as those of the tailwheel. The uneven spring pair is evidently offered as a way to mitigate shimmy, but with a left-turning prop, and hence greater on-ground P-factor thrust on the left side, I think I will break with tradition and swap the stiffer spring to the left side. I think I'll keep my Maule TW for now. Plunka-plunka-plunka! I had my spring break on my Model B single spring and now on my MK4 double leaf. Ishould mention that I do a lot of landings on grass, dirt and gravel. I can see where the spring was cracked for a while. I bought the experimental spring from Spruce and had to drill out the 3/8bits. th hole at the tail wheel to 7/16 th. Went through some costly drill bits. This spring is about 3 inches longer than the one I replaced and I find that when I make the sterring spring tention enough to give positive steering then they won't kick out into the caster mode. I see that you bought 25 degree wings to allow an earlier caster. I will call MATCO and have therm send me these. This should help. The 25 deg wings are important, the 45s will not release consistently. I know about drilling spring steel, I used the same bit and resharpened it about 5 times! I switched to a double spring last year, and find it perfect now. The double spring stops 1" short of the Tail Wheel, I used a steel bolted clamp to hold everything in alignment, seems to work well. I've got a milling machine and carbide cutters for hole stretching but that stuff if even hard on carbide. My friend never owned a cutting torch but cut lots of steel with an old antique stick welder. He had an endless supply of welding rods in all sizes he had picked up at an estate sale for pennies. If he needed to cut steel or burn a hole in something he grabbed a rod out of his stack and turned up his welder as high as it would go. The welding rod don't seem to mind if it's hard or not. For those that have never seen this done or tried it, grab a piece of scrap steel sometime and give it a shot. Save those old welding rods that got wet and have the coating breaking off as they still work great for punching holes. Lots of heat turns spring steel into not so springy steel. A drill press and cutting fluid are your friend. I bought a speed reduction set up for mine so I can turn big bits and hole saws really slow and get nice cuts without getting heat build up or killing my bits. Most issues with dull bits are from too high of RPM, too much pressure and not using good cutting fluid. If you play in the shop and use the hell out of your drill press like I do, this is money well spent.